In the last years the insurance industry is facing major challenges and digital transformations where startups are playing theirs roles on facilitating such a process. Lemonade, one of the most famous Insurtech, with the launch of Lemonade API it has just made another step beyond its ambition to rethink the entire insurance industry. What Lemonade wants to achieve with its Lemonade API is re-designing insurances into an Insurance as a Service (IaaS) business model. In practice, an API (Application Programming Interface) is an interface where any other business, mobile APP or website, can access to get a specific service. In the case of Lemonade API, the service provided is an insurance. With Lemonade Widget, any website can thus provide to users the service of issuing a home insurance. For example, from a Real Estate Comparison website, once the user has chosen its house to buy or to rent, then it can buy a coverage directly by clicking the button . Similarly, imagine to buy a new brand TV, notebook or furniture for your home from an E-Commerce website. Maybe you want also to insure them from damages or theft. With such an API that can be done just when purchasing. And what about adding insurance services to mobile APPs users? That can be done with Lemonade Rest API. After adding the interface to the code, the insurance service it will be available within the mobile APP. For example, a user who is accessing to its Smart Security Mobile APP to check if everything is ok at its home, maybe it wants its stuff covered to feel more secure. Similarly, there are many APPs helping people to manage personal finances and expenses. An insurance that cover with a fair price a valuable item just purchased could be the case, especially if it has been asked a loan. Open APIs is not only about insurance. Oracle one month ago has launched its API Banking solution aimed to support financial institution to deliver digital customer experiences, secure payments and an effective identity management against frauds. Interesting to noticed that, as far as the API Baking service is charged according to the volume of the transactions, who can benefit of such a service are not only big financial institutions but also emerging fintech startup. Technology apart, Lemonade Open API is going to put insurance at the end of the value chain. Life Insurance apart, the P&C segment is pulled by the numbers and the worth of the items owned. Whenever a consumer buy a house, TV or a new car, a need for a coverage exists. Putting an API just at the moment of purchasing is simply providing a more linear customer journey experience: why customers should buy an insurance by themselves after purchasing? Or why customers should rely on the insurance provided by lenders or car dealers? Many big insurance companies have already established an E-Commerce channel within a digital strategy aimed to be more close to customers. But is really E-Commerce in insurance the right path towards a customer centricity? Open APIs would thus enable open business ecosystems. I’m very curious to see how Open APIs will transform (or not) insurance and financial industries in the next years. Following the exponential growth of insurance startups (Insurtech) throughout last years, in this second edition of FinTech book a dedicated book focusing on Insurtech is planned in 2017 with the same formula of crowdsourcing. Since the level of maturity reached by the Insurtech ecosystem, it’s time to consolidate all the ideas coming from startups in order to establish sustainable businesses out of them with a straightforward approach. How to build Insurtech Value Chains’ Ecosystems: “Corporates have now wholesale outsourced R&D to the startup and venture community” (Dave McClure, founder of 500 StartUps). In his Insurtech Manifesto Matteo Carbone, one of the top Insurtech influencers, have already done a great job by classifying such a wide universe of Insurtechs. Many other insurance experts developed different maps as Carbone did, but how to really set up new business and insurance value chains that are sustainable for millennials and digital natives? In this article, a structured R&D methodology to generate new business models by leveraging the startups community is described. Strategic Positions towards Disruptive Startups: In 2015 and 2016 the number of deals in Insurtech startups have been 295, accounting for 4.38 $B of investments. Respectively, 56% of deals and 73% of investments if considering the whole period between 2011 and 2017 (see CB Insights). In such a context, do big insurance players consider Startups as a threat or as an opportunity to embrace disruptions? By rating insurers as well as brokers upon two criteria, theirs Market Leadership and Disruptive Attitude, the result is a magic quadrant where four strategic possible positions towards startups are represented: Disruptive Leadership, Conservative Leadership, Disruption Hunter and Conservative Niche. Who will be the Disruptive Leader in 2017? For the full Abstracts just click on the links of the bullet points above and if you’d love to see the full articles published, just leave a vote by 28th Feb 2017. New IT Innovation Development (N.IT.I.D) method Step 1: Brain Storming (Tripadvisor Case Study). New IT Innovation Development (N.IT.I.D) method Step 2: Simplify (Tripadvisor Case Study). 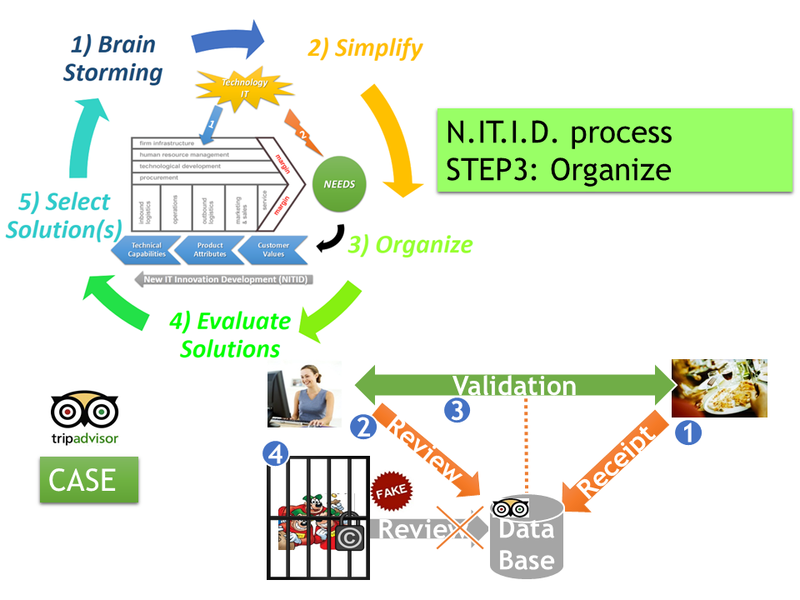 New IT Innovation Development (N.IT.I.D) method Step 3: Organize (Tripadvisor Case Study). New IT Innovation Development (N.IT.I.D) method Step 4: Evaluate Solutions (Tripadvisor Case Study). After brainstorming, simplifying, organizing and evaluating all the ideas, finally it’s time to select the BigData solution in which to invest. Thanks to the QFD matrix, the key parameters and competencies that are required for fulfilling the customer needs have been identified. Moreover, the QFD assesses how the development of a new idea will change the strategic position of the company in the market through a gap analysis. Anyhow, which idea to choose among all the bigdata IT initiatives? The question can be addressed by using the Pugh matrix in the table below. 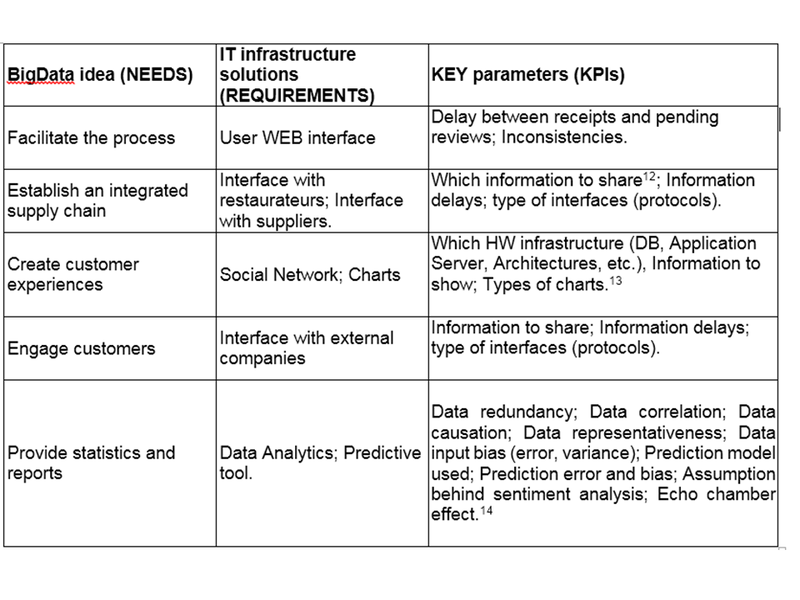 In particular, in our PUGH matrix of TripAdvisor, all bigdata initiatives are the new functions (needs) to implement and putted into rows: facilitate the process, establish an integrated supply chain, create customer experiences, engage customers and provide statistics and reports. Meanwhile, all the IT solutions (requirements) are putted into columns: WEB user interface, restaurateur interface, suppliers interface, social networks, visual charts, external company’s interface, data analytics and predictive tools. In the PUGH matrix a final benchmark is accomplished by assigning for each interception a score that might be -1, +1 or 0, respectively if the solution proposed is worse, better or equal on satisfying the specific need to a solution defined as a reference (market). The solution to use as a reference for the in the Pugh matrix should be either one of the best solution of the market (e.g. : Booking) or the solution AS-IS that is currently provided to the customer. The Pugh result is given by the sum of all the scores into rows and it is representative of much innovative and useful solution is. 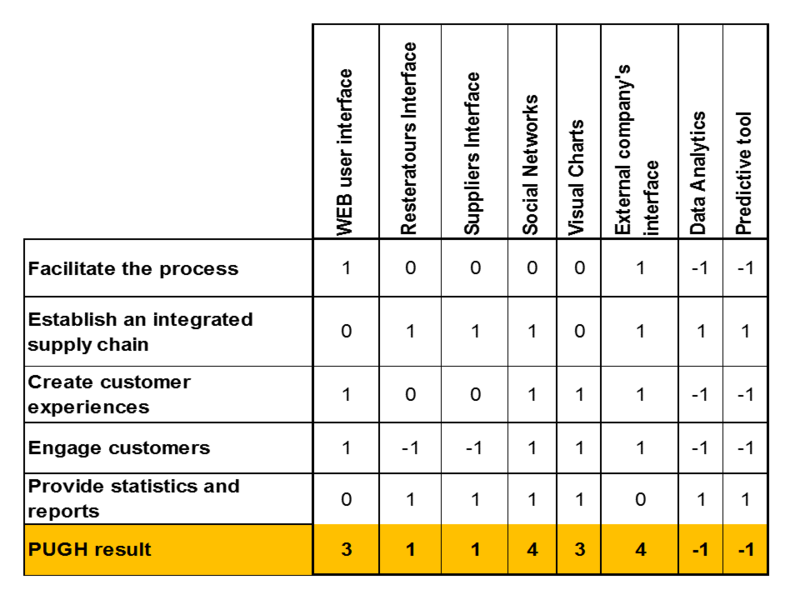 As an example, according to results in the PUGH matrix, the most innovative solutions are the creation of a social network and the external company interface (EDI). However, within a strategy plan definition such solutions might be risky due to the investments involved, more IT complexity to manage and agreements with stakeholders. On the contrary, WEB user interface and Visual Charts, that have the second highest score (3) might be easily implemented and ready to use by the users of TripAdvisor. Thus, these solutions might be developed in order to quickly get a competitive advantage. Not necessarily, the highest Pugh score is the best solution must be choosen. In this sense, the Pugh matrix is useful, rather than univocally determining one IT initiative, to encourage and stimulate a well-defined strategy with a proper staging. In particular, in a strategy plan based on Pugh’s results it might be stated that a social network should be created only when the customer engagement has been improved enough thanks to WEB user interface and Visual Charts. By doing so, it is possible to leverage the customer commitment for achieving the network effect when promoting the social network initiative. Similarly, if becoming a platform for an integrated supply chain is one of the long-term objectives, a proper staging and pace of the related IT initiatives should be defined in a way that fits the company DNA (see A question about IT change management: does the DNA of the company fit your IT vendor?). For example, if TripAdvisor is a “cautious adopter”, it will better to first implement restaurateur’s interface IT initiative in order to engage them and then involve also suppliers with supplier’s interface. 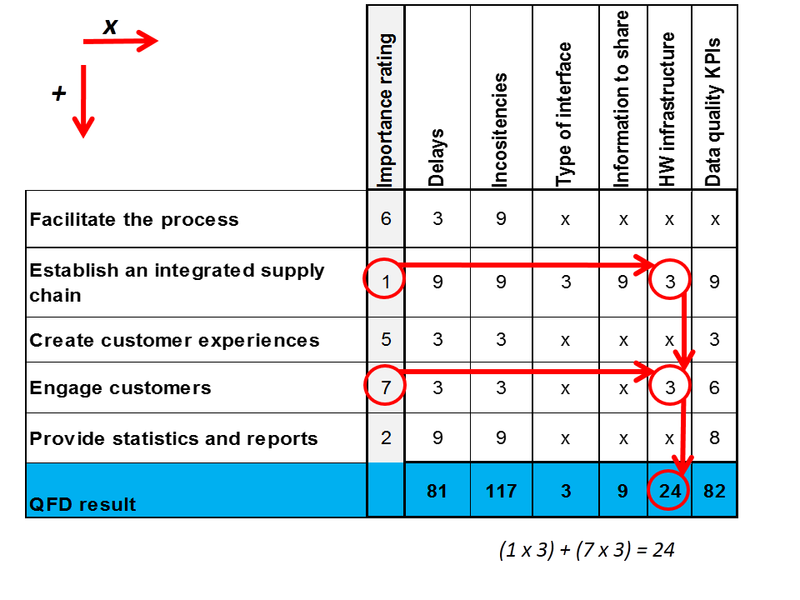 Furthermore, as an example, specifically for the data analytics and predictive tool IT solutions (requirements), the KPIs to adopt are linked with the key performances evaluated in the QFD matrix through the need “providing statistics and reports” (see Table in New IT Innovation Development (N.IT.I.D) method Step 4: Evaluate Solutions). In particular, the key parameters are data redundancy, correlation, representatives, etc. as a measure of the quality of the data to gather and collect. In such a way, it will be ensured reliable information and insights by considering all the relevant aspects: information theory, statistic, control theory and psychology (see Caution!!! BigData S.L.I.P.S. : five tips when using analytics). 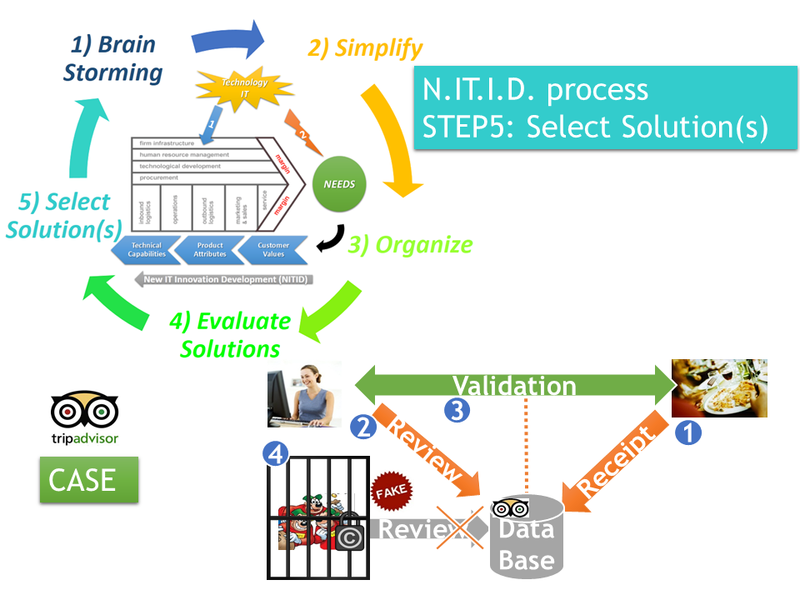 With the Step 5 (Select Solution), the N.IT.I.D method for developing new business model thanks to BigData is accomplished. So… Would Tripadvisor adopt new BigData initiatives? What Logistic, Supply Chains and Telecommunication have in common? (part 2) Mr “Lean” Hartley-Shannon! What Logistic, Supply Chains and Telecommunication have in common? Mr “Lean” Kendall! the queue theory links together telecommunication and supply chains management (SCM) since both actually share the same issue: how to deal with queues? increase inventories in order to compensate demand volatility. increase velocity that means achieving low lead times (production, supplies, deliveries) in terms of material flows and information flows as well. Anyhow, how to face market demand volatility providing to customers the same Time To Delivery (velocity) without increasing inventories (waste of resources)? Nowadays markets are more volatile than in the past and customers are expecting short time to delivery (see the same day of delivery battle between amazon and Ebay). How to be more reactive toward changes in market demand? T = is the reference period when measuring the market demand. Actually, with regards to S&OP (Sales & Operation Planning), is when customers’ orders are aggregated for defining the schedules for the next period. (es. 1 month). 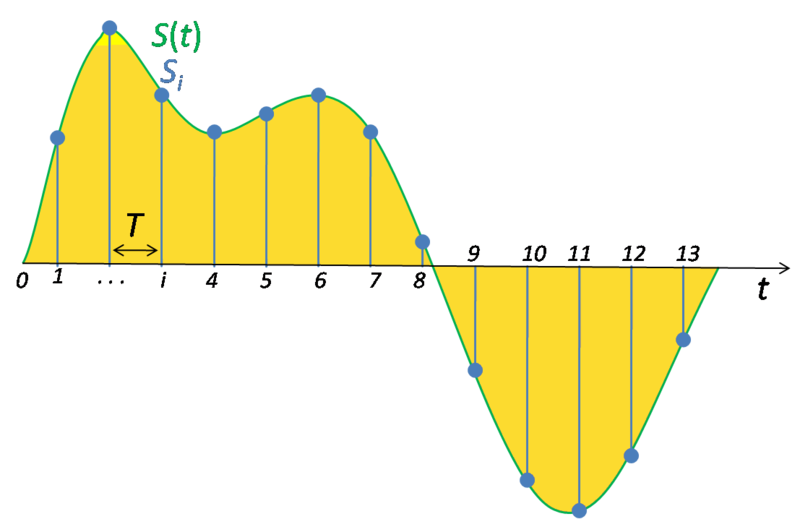 Si = is the level of the demand (aggregated orders) at time i. For example S1 = 200 pz in January (i=1), S2 = 150 pz (i=2) in February and so on. Well, according to Shannon-Hartley theorem T is the sampling period. Intuitively, the shorter the period the better signal changes are tracked. And what does this mean in practice when dealing with demand volatility? As an example, it means that if customers’ orders are aggregated once per month, no more than a change within a period of 2 months can be managed by the company. No matter if MRPs, TQM, Lean Manufacturing and other tools are in place. According to Lean Thinking (see to James Womack), the challenge is switching from batch & queue paradigm to one piece flow manufacturing. That is the philosophy for reducing waste: inventories and time. Batch & queue paradigm is the main cause of waste, both in terms of high inventories (low liquidity for investments) and time (effectiveness). Companies that are re-thinking theirs business model towards a one piece flow approach will achieve operational excellence and market effectiveness. and negotiate with suppliers weekly instead of monthly deliveries. …and here where issues come out. There are all constraints for improving velocity and TTD. why frequency and tack time are so important in lean manufacturing as well as the demand planning period for S&OP? 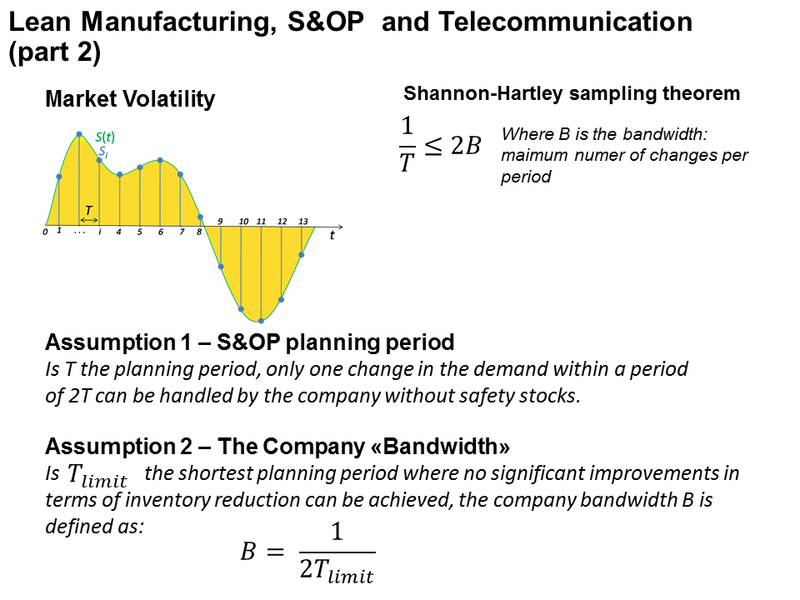 It can be inferred that, according to Shannon-Hartely sampling theorem, it’s because the demand planning period (S&OP) is strictly correlated with the ability of the company to react on changes in the market. T is the planning period so that only one change in the demand within a period of 2T can be handled by the company without safety stocks. From another perspective, what if the company attempts to reduce the planning period T? There is a T_limit, due to many constraints such as lead times (suppliers, cycles,…), set-ups, shipments,… where a further reduction of the planning period will not produce significant improvements in terms of inventory reduction and TTD. Again, thanks to Shannon-Hartely sampling theorem, the T_limit defines a kind of company bandwidth, a KPI for measuring the ability of the company to mange market volatility without increasing inventories. company bandwidth B = 1 changes / 1 month. That means that the company can react to demand changes once per month without increasing inventories. the T_limit is equal to 1 / (2*B) = 1 / (2*1) = 0.5 month. Thus, lowering the demand planning period below 2 times per month does not produce any significant improvement and inventory reduction. can you guess which is the bandwidth in your company? After brainstorming new idea and organize them, the next step of the N.IT.I.D. method is to evaluate the solution proposed for the TripAdvsor case study. The KJ method in the Step 3 (Organize), it has been possible to organize the un-structured brainstormed ideas in a structure way. The next phase is to connect all the ideas grouped with KJ method with the key performances needed in order to satisfy new functionalities. In order to evaluate the solutions, all the key performances must be measurable. For example, the “facilitate the process” BigData initiation needs a new WEB interface to develop in order to create a list of pending reviews. In this case, some key measurable parameters for the interface should be the delay and inconsistency between the pending reviews shown and the incoming new receipts. By putting needs into rows and the list of KPIs listed in the Table into columns, it is possible to create the QFD (Quality Function Development) matrix (see Figure below). In this example it has been assigned a score for each KPI with values X (no relations), 3 (weak relation) or 9 (strong relation) and an importance rating (e.g. from 0 to 9) for each new need accordingly to the priorities and objectives of the company. For example, the importance rating should be assessed by considering factors such as the customer value curve, opportunity to innovate for getting a competitive advantage or risks (e.g. : disruptive innovations from competitors). Finally, the QFD score for each KPI is given by the sum of the scores intercepted by weighting (multiplying) them accordingly to the importance rating. The aim of the QFD matrix is to link in a structured way the ideas (needs) with the key performances. Moreover, by assigning a score for each KPIs that measure its importance in order to satisfy the need it is possible to obtain an indicator of relevance for each key performance. In the example, KPI inconsistencies (fake reviews and Negative SEO) is the most relevant KPI to consider since got the highest score (117). Meanwhile, according to the importance rating, the most relevant ideas are Engage Customers and Facilitate the Process. However, are they the ones that should be really implemented by TripAdvisor? In telecommunication engineering, queue’s theory is applied whenever dealing with design of telecommunication networks. Anyhow, actually in our every day life we are all “victims” of queues. For example, when waiting to pay at the supermarket, when blocked in the traffic jam and when, as a customer, waiting the delivery of a purchased item. Or, when dealing with Supply Chains, delivery delays and high level of stocks. After almost ten years from University, it has been exiting for me discovered that the same principles behind the queue’s theory in Telecommunication can be applied in a totally different field where I work: logistic and supply chain. Anyhow, which are the principles that telecommunication and supply chain management (SCM) have in common? They both could be described by using a specific statistical model “A/B/k”. B: it describes how the entries in the queue are processes and thus theirs statistics. It could be the same model as for arrivals or different. k: is number of places of the “waiting area”. If k=1 it means that new arrivals will be discharged if new entries occur. While if k=5, as an example, there are 4 places available for new arrivals till a new entry can be processed in the queue. the capacity of the telecommunication channel. How many calls per minute can be processed? Or how many Gbytes/s can be provided by a network connection? the memory available that is the number k in the Kendall’s notification. 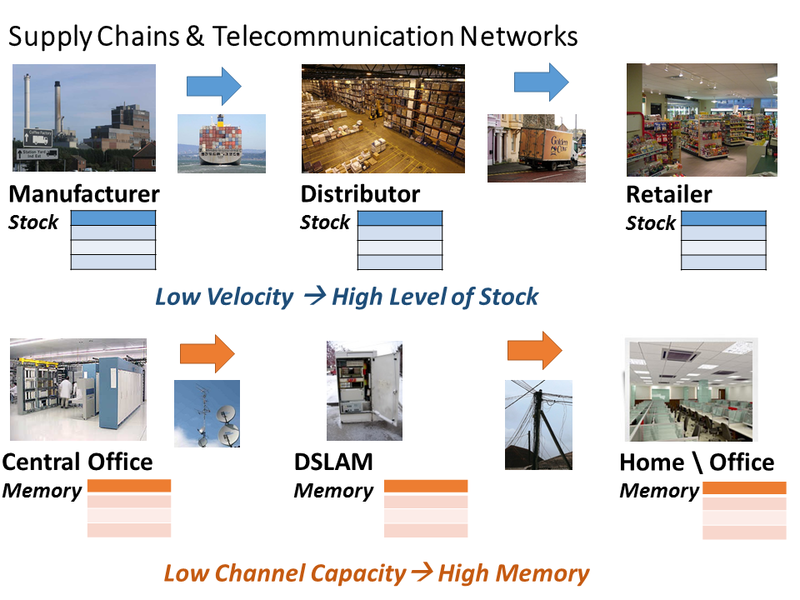 Channel capacity and Memory Available are Link each other. Low Channel Capacity might be Compensated by Increasing the Memory Available. So, what a telecommunication network described with a Kendall’s notification have in common with SCM? A new business model for Tripadvisor has been developed thanks to BigData IT Innovations. After brainstorming (Step 1) and then simplifying (Step 2) the founded new opportunities emerged from such a new business model, the next step for the N.IT.ID method is: Organize. The purpose of organizing is to obtain a set of ideas and innovations that are structured according to a criteria that will be useful during the remaining two steps 4 and 5: Evaluate and Select. identify relations among groups (correlations, dependencies,…). In order to create affinity groups, it is necessary to define a criteria. Let’s assume as a criteria the function in the company (value chain), that would be involved for each idea. In particular, within the organization of Tripadvisor, A) facilitating the process and B) establishing an integrated supply chain are about its Operations’ activities. While C) Creating Customers Experiences and D) Engaging customers they are responsibilities under Sales & Marketing department. Finally, D) Providing Statistics and Reports might be considered as an additional Service (e.g. : after sales). As it has been done during the previous N.IT.I.D Step 2 – Simplify, it might be useful to further reduce the number of new initiatives by ranking the affinity groups and eliminating those groups that are less important. For example, each team member should give a vote between 1 to 6 accordingly to its perception of importance (1 = low, 6 = very high) and then keep only the highly scored groups. In this case, since there are only three groups, it does not make sense eliminate any groups. Better would be to keep all the three groups for the next N.IT.I.D. – Step: Evaluate. 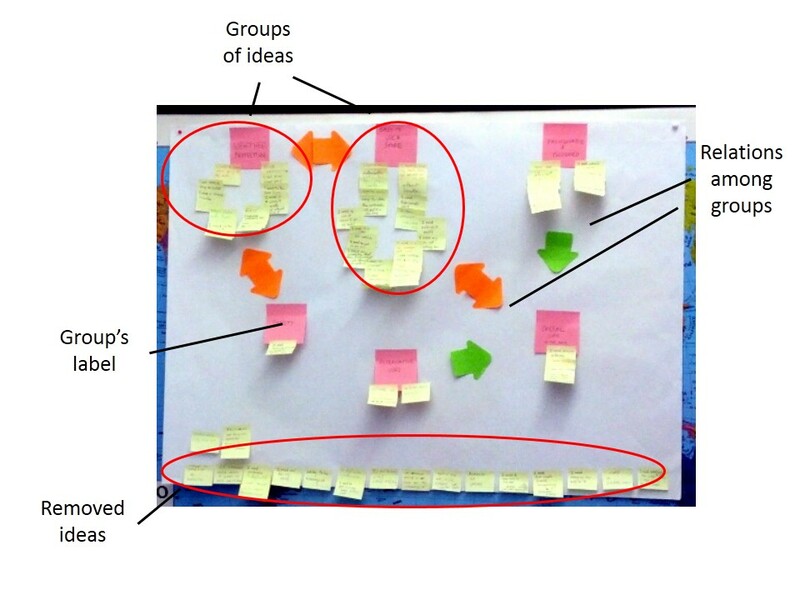 In a similar way at point 1, group again the groups of ideas that are similar according to another criteria. 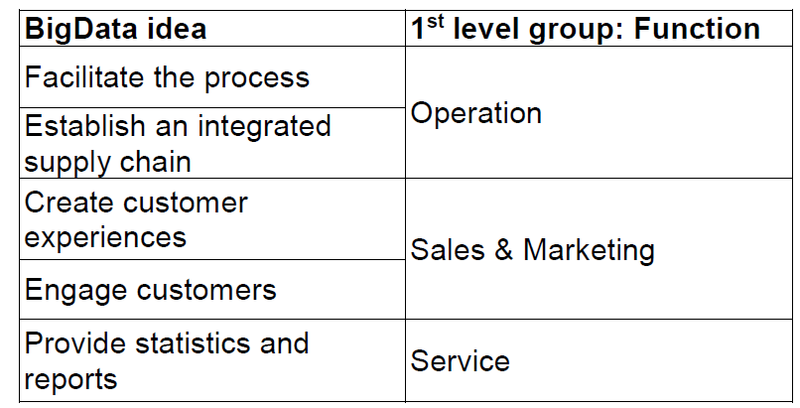 Using as a second criteria the Stakeholder potentially involved that are Customer, Suppliers (Restaurateurs and Hotels) and Collaborators, here below the 2nd level affinity groups: In particular, Customers & Suppliers are engaged in the idea A) facilitating the process and B) establishing an integrated supply chain. While, Customers & Collaborators are involved for C) Creating Customers Experiences and D) Engaging customers. Finally, D) Providing Statistics and Reports might be considered as an additional Service (e.g. : after sales) for Suppliers. As for N.IT.I.D Step 2 – Simplify, define a general topic or common theme that labels each 2nd level groups. 5) Identify relations among groups (correlations, dependencies,…). The last point is to identify relations among the 2nd level groups. In particular, as it is shown in the Figure below, there are two relations: one that is related to customers and one that is related to suppliers. 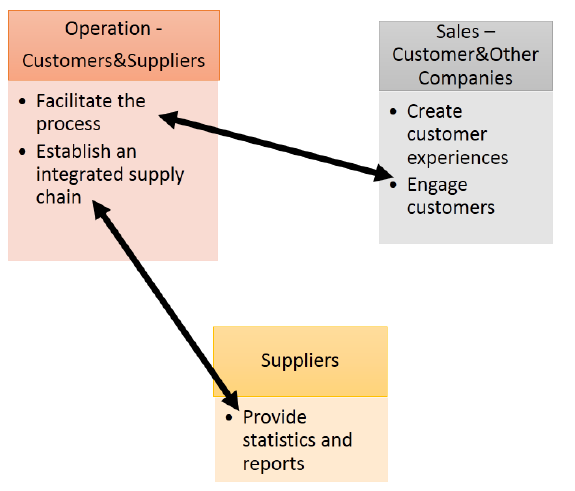 Precisely, the customer as a stakeholder create a link between “facilitate the process” and “engage customer” functionalities, while suppliers enable a connection between “integrated supply chain” and “provide statistics” ideas. The Step 3 – Organize is actually the so called KJ Method developed by Jiro Kawakita. Writing all the ideas into cards and using a whiteboard where to post them, it would be useful in order to have always the view of the “big picture” during the process. Here below an example of it might look like a N.IT.ID process after Organize (Step 3). what is missing is strong linkage between the world economy and the limited biocapacity of the planet Earth. 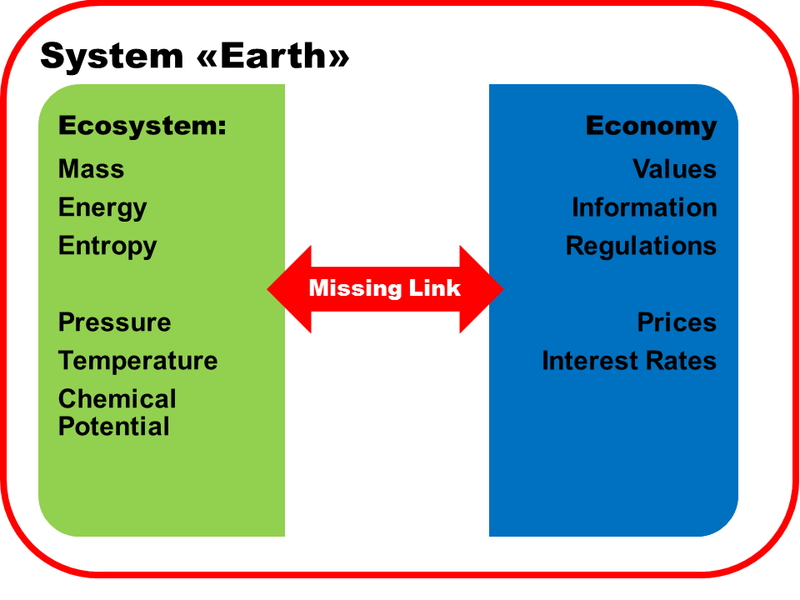 The missing link between economy and ecosystem has been already pointed out by many researchers . Both, natural ecosystem and world economy are complex system and theirs outcomes are not easy to define analytically, to predict and to manage. Regarding the ecosystems, the Global Footprint Network is attempting to provide a measure about the biocapacity of each country as well as for all over the world. This year (2014), human activities have consumed all the biocapacity available on 19th of August . A possible link between the world economy and the ecosystem might be established thanks to Thermoeconomics : that is Thermodynamics applied to Economy. The ecosystem, thanks to photosynthesis and Krebs cycles, is efficiently using the resources in the Earth (mass and energy) without producing any waste. The variables of an ecosystem are its biocapacity (mass: forests, animals, soil, water,…), energy, temperature, etc. and they are regulated by physics’ laws. On the contrary, human activity is evolving and economy is growing because of energy dispersal without re-integrating biocapacity consumptions (deforestation, species’ extinctions, water, natural resources, etc) . Values (money), regulations, prices, interest rates, etc. are the variables of the economy. Human behaviors and outcomes of the economy are governed by Mankiw’s ten principles . What economy produce as an exchange for growth is mainly waste and pollution: something that neither the economic nor ecosystem environments are able to use as a resource. How to Link World Economy & Ecosystem? Since the beginning of the 19th century, many scientists, biologists, physics and economists, have conducted several studies and developed theories as well in order to address the missing link between economy and the entire ecosystems . Assumption 1: to each money transaction correspond a flow of energy or biocapacity. Assumption 2: to each economic interaction among economic actors corresponds a transfer of value that is represented by a monetary flow. issuing a loan: a transfer of money from banks to households\firms. taxes and subsidies: transfers of money between households\firms and governments. the act of printing money by the central bank incentivize the volume of the economic transactions since more money is putted into the system. producing goods\services means adding a value in the economic environment that is equal to the (price – cost of production). consuming goods\services means decreasing the value in the economic system that is equal to the price paid for the goods\services. To Each Interaction among Economic Actors Corresponds both a Monetary Flow and an Energy Flow. The new Principle N.12 is about how to deal with complex systems as both economy and ecosystem they are. In a complex system mostly of the times something strange, new and unexpected happen that is called as “emergent phenomena“. An example, is the human body. A body is actually a mass o billions of one-celled organism like bacteria. Well, would a unicellular organism exist without human bodies? Of course, Yes. There are even bacteria that infect our organism. On the contrary, would human bodies exist without unicellular organisms? No! Therefore, the questions above suggest us that a human body is an emergent phenomena of unicellular organisms as well as there is also clear hierarchy of existence among complex systems. What about Economy and Ecosystem? Would Ecosystem exists without Economy? Yes, as it happened before humankind. On the contrary, would Economy exists without Ecosystem? No way. Economy is an emergent phenomena created by humankind, and humankind is an emergent phenomena of Ecosystem as well. As a matter of fact, human beings can not exist without the support of the Ecosystem: mainly food, water and energy. The Economic Environment is an Emergent Phenomena of the Ecosystem. what does they mean in practice, both for economic activities and enviroment sustainability? : I. Gruer, “The 2nd Law (part 2) – My Issue with Ecological Sustainability and World Economy (Mankiw’s Ten Principles)”. Posted Sept. 10, 2014, http://www.ivangruer.com. : Peter A. Corning. “Control Information Theory: The Missing Link in the Science of Cybernetics”. System Research and Behavioral Science. n.24, pp 297-311, 2007.
: Peter A. Corning. “Thermoeconomics: Beyond the Second Law”. Journal of Bioeconomics. Vol. 4 – Issue 1, pp 57-88, 2002.
: M. Gong, G. Wall. “On Exergetics, Economics, and Optimization of Technical Process to Meet Enviromental Conditions”. International Conference on Thermodynamic Analysis and Improvements on Energy Systems. 10-13 June 1997. Beijing, China. : N.Gregory Mankiw. Principles of Economics 6e. South-Western, Cenage Learning. Peter A. Corning. Holistic Darwinism: Synergy, Cybernetics, and the Bioeconomics of Evolution. University Of Chicago Press. 2005.
: N.Gregory Mankiw. “A Carbon Tax that America could Love with”. New York Times. 01. Sept. 2014.
: Buttonwood’s Notebook. “Energy use and Growth: an Optimistic View”. The Economist. 26 June 2013. See also: New IT Innovation Development (N.IT.I.D) method Step 2: Simplify (Tripadvisor Case Study). 1) Facilitate the process of the reviews for users by updating a list of “pending reviews” to fill once a new bill in a restaurant\hotel has been recorded. 2) Create “customer experiences” through new visualization charts such as a map of visited restaurants and hotels and\or a social network that connect users together in order to share the experiences. 3) Engage customers by creating synergies with loyalty programs. 4) Provide statistics and reports that might be useful to restaurateurs and hotel managers. 5) Establish an integrated supply chain by providing further additional services to restaurateurs and hotels. All these ideas required investments, in terms of IT infrastructures, human resources and agreements with stakeholders or third parties. Will such investments have a return? Hard to say now. Better first to jump at the second Step of the N.IT.I.D. process: Simplify. The idea\image should identify briefly the concept. In this case, simply let’s keep as images for the opportunities mentioned above the words in bold: facilitate the process, create customer experiences, engage customers, provide statistics and reports, establish an integrated supply chain. After giving a simplified sentence, some ideas might be redundant. In this case, no redundancies emerged and thus all the idea should be kept on the table. With a set ideas that are unique (no redundancies) a vote among all the team members should rank the opportunities. For example, each member can give to each idea a score between 1 to 6: 1 not relevant at all and 6 extremely relevant. The sum of the votes than will rank all the opportunities by theirs relevance. An important recommendation: when ranking, each team member should evaluate ideas with a score between 1 and 6, without providing any justification. The vote should be only about perceptions, intuitions, and feelings. As Edward de Bono would say: “wear the red hat!” (see 6 Thinking Hats). After ranking all the ideas, the group might decide to keep only the most relevant ones (e.g. : first ten idea). Anyhow, do not throw away the removed ideas. Keep them in a temporary basket because they might be useful during steps 4 and 5 (Evaluate and Select solutions). In our case, since there are only five items, all the ideas will be kept as important for the next step: Organize.